Back in the sixties, when not everyone under 35 was a bedroom producer or in a band, guitars were somewhat rare and expensive. If you were a company trying to make waves and compete with the likes of Fender in the electric guitar stakes, you needed to think outside the box. In 1967 Vox, makers of the famous AC30 guitar amplifier combo, which helped to shape the sounds of the sixties in the UK, devised a wild publicity stunt that has become somewhat lost in time. Using the talents of George Barris of Barris Kustoms, who was renowned as the designer of the Batmobile for the original Batman series, Vox came up with the concept of building a 2-seater roadster based on the Vox Phantom guitar. 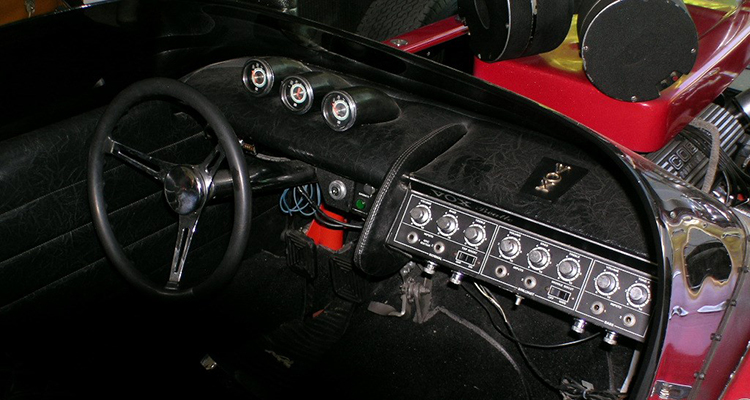 The Vox-Mobile (or Voxmobile) functioned as both car and amplifier thanks to the roadster incorporating three Vox amps sharing a total of 12 speakers. 32 guitar jack inputs were to be found along the side body panels. And if that doesn’t sound batty enough, there was a Vox Super Continental organ mounted along the rear of the car. 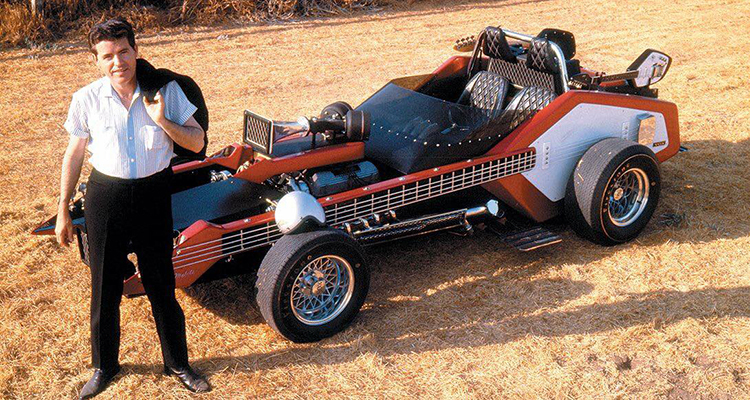 The roadster also had custom chromed side steps on each side of the car, to allow guitarists to play – precariously – while the car was moving along. In case no-one brave enough could be found, the Vox-Mobile also had a Muntz 8-track player on board. The roadster really wasn’t just a static shell for people to stare at open-mouthed though, as the car housed a Ford Cobra 289 engine giving it a reputed top speed of 175mph. Part of the reason you might not be so familiar with the Vox-Mobile is that it didn’t feature in the movie it was partly intended for. Psych-Out was a 1968 psychedelic counter-culture film about the aftermath of the Summer of Love and all the baggage that 1967 ended up thrusting upon the laid-back hippies from that memorable period in time. The film starred Jack Nicholson and Susan Strasbourg. Scenes were shot with the Vox-Mobile for the movie, but sadly these didn’t make the final cut. 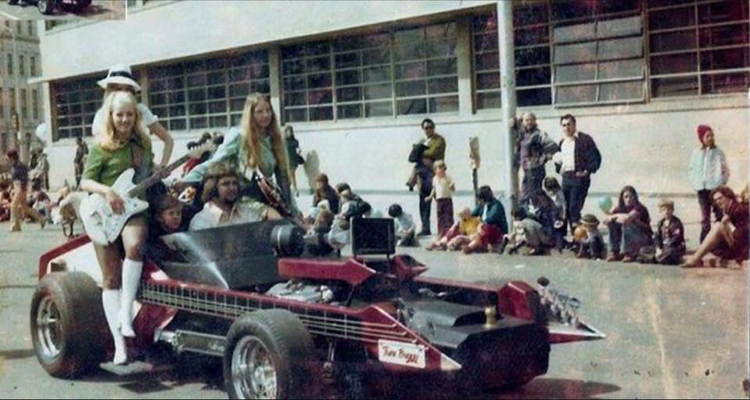 It wasn’t the end for Vox’s crazy roadster though – the car proved too tempting for Strawberry Alarm Clock to not perform with it on Venice Beach in Los Angeles, and later the TV series Beverly Hillbillies used the Vox-Mobile in one episode of the long-running series that ran from 1962-1971. 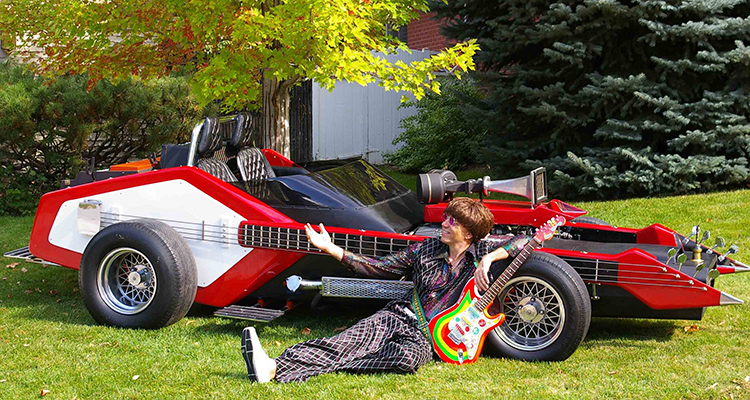 The car also features in many great publicity shots for country guitarist Jimmy Bryant who played fiddle on The Monkees’ Sweet Yong Thing – a band that had their very own wacky car of course. Today the roadster, which has also been known as the Tune Buggy, even has its own Facebook fan-page (search ‘voxmobile’) where a plethora of fantastically daft publicity shots can be found. Rumour has it that the Vox-Mobile is still going strong under the ownership of American comedian and ventriloquist Jeff Dunham.